In 3 days time (Friday April 11th 2014) entry’s close for the 2014 British Pie Awards and I’m using this latest entry into the Meat Filled Hall of Fame to encourage all you pie fans to ensure that the tastiest football pastries are proudly presented at this annual extravaganza. If you read this then please let your club know, let your fellow fans know whether they be supporters of your club or another and let the friendly faces behind the pie stalls up and down the country know that this is the time for their pastries to shine. More information can be found at this link, http://www.britishpieawards.co.uk so go and have a look but until then with much gust and little further ado, let’s rate some pie! Price: Priced at £1.20, this is the same price as the standard scotch offering, re-opening the debate as to whether or not an onion pie should be bracketed as one that is luxury in nature. Presentation: I touched on the lovely ladies behind the counter in my previous review (Pie 60: The Cumnock Pie) so we can return our focus onto the ever classical but oh so minimalistic production values of the medium-sized white napkin in which this pie was nestled. Standard. Meatiness: This pie had that distinctive waft of onion that I have come to associate with pies of this nature although not as strong as other similar offerings. The meat inside was formed in a way similar to a scotch pie, a seasoned block of mutton that whilst lacking in that distinctive peppery kick was laden with chucks of near translucent white onion. There was enough fat within the pie to keep it moist, perhaps a little greasy for some but nothing that a couple of extra steps on a treadmill couldn’t take care of. I would add that in this instance a dot of brown sauce would have definitely enhanced the overall taste experience due to the fact it’s meaty content was that of a scotch pie but as I am treating this as a luxury option not a drop was to be had on this occasion. Pastry: The main distinguishing feature of this pie was the two holes on top of the classic scotch pie casing, this I assume helps to easily distinguish between the normal scotch and onion options available whilst serving. Outside of this it was a normal hot water pastry surround and top. It was a little bit caught around one edge but nothing that was too detrimental to the overall flavour of the pie. A solid pastry casing for the meat inside that tore apart as your mouth would expect it to on each bite. Overall: A sweet onion pie that whilst different was also very much the same as the scotch pie effort. The large chunks of onion added extra flavour but maybe could have been a little more cooked through before adding to the mince. It would have benefitted from a glistening blob of brown sauce and perhaps being a tad less greasy but this was still a tasty treat. Gravy Factor: Chunky Onion Gravy. After a whistle-stop tour of East Ayrshire we have reached pie number 61, the next offering is to come from a yet undetermined location and as soon as I know the Meat Filled Pastries twitter, which you can follow on the right side of this page, will be the first place to tell you but until then go forth and eat pie! My latest non pie piece ‘Deliberate Deliberations’ is found not only on Leading The Line but also at www.footballbloggingawards.co.uk looking at what constitutes a deliberate handball in the modern game. An archive of all my non-pie pieces can be found on Leading the Line and on The FBA’s website. This entry was posted in Football Pies, Junior Pies, Luxury Pies, Sporting Pies, The Life of Pie and tagged british pie awards, brown sauce, cumnock, Football, football blogging awards, Gravy, junior football, leading the line, Meat, meat fill, meat filled merch, meat filled pastries, mince, onion, pastry, Pie, pollok, scottish football. 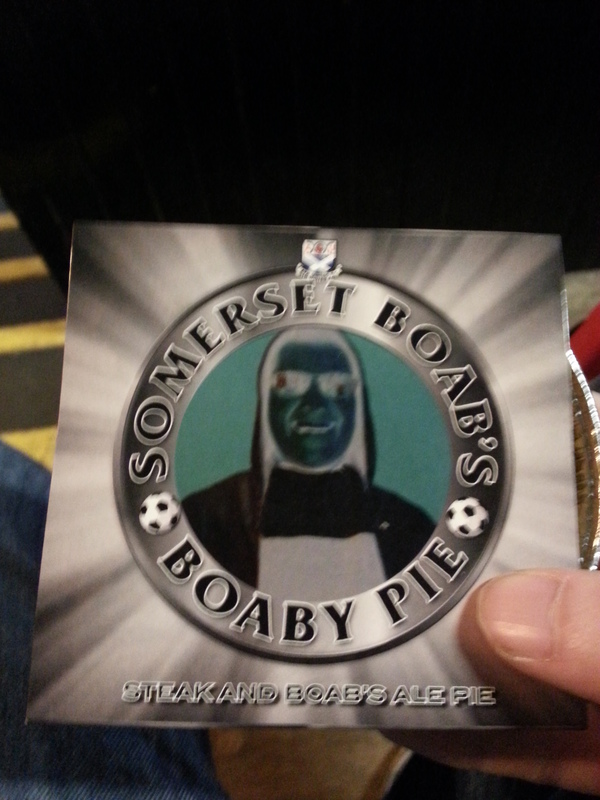 This pie is in no way affiliated with the fictional team Auchinleck Town. Welcome to Meat Filled Pastries, my mission to ensure that the mighty pie remains at the forefront of fans mind everywhere when hunger strikes at football grounds across the country. Battling the increasing onslaught by chips, burgers, curries and hotdogs to barge its way to the front of your local refreshment counters. As steeped in footballing tradition as the half-time draw, the busted coupon and jumpers for goalpost the pie is football’s culinary gift to the world and as long as I have breath I will ensure it remains that way. Say ‘Aye to Pie’. Anyway we have two reviews from Auchinleck to get through in the next few days so without much further ado, let’s rate some pie! Price: £1.20. That’s right another club who has gone for the junior average of £1.20. I wonder if at the start of the season clubs have a meeting where they decide what the maximum and minimum price of a pie should be. If they do it can I request you to stop doing so and go wild by throwing in a £1.14 or a £1.06 every now and again as it can make for a pretty boring opening to a review unless a rant such as the small one I’ve gone on there takes my fancy. Moving on. Presentation: A medium-sized white napkin, the classical look most commonly associated with football based meat and pastry parcels. 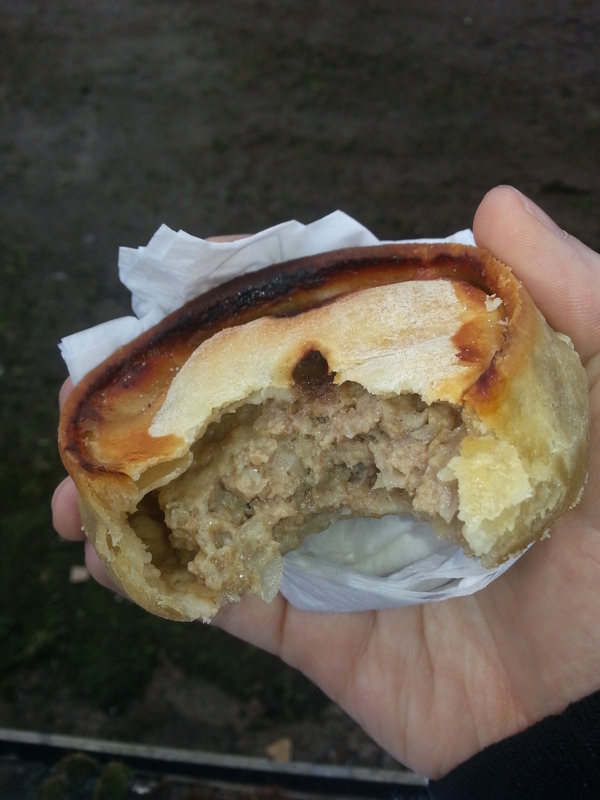 Meatiness: This was not a scotch pie as anticipated but instead I was greeted with a filling of thick mince and gravy a detour from the loosely formed block of meat you would find in your standard scotch pie. The mince was seasoned very well and the thick gravy that surrounded it caused a playful little dribble to form on my chin the further I delved into its meaty goodness. It was tasty and as such I would have liked a little more of it as on further inspection the fill levels seemed rather shallow when measured against the pastry walls surrounding it. They do however say always leave them wanting more so maybe this is just a clever rouse to get the humble punter to consume yet another meaty morsel so this is but a minor complaint. My main problem, was one of my own doing. 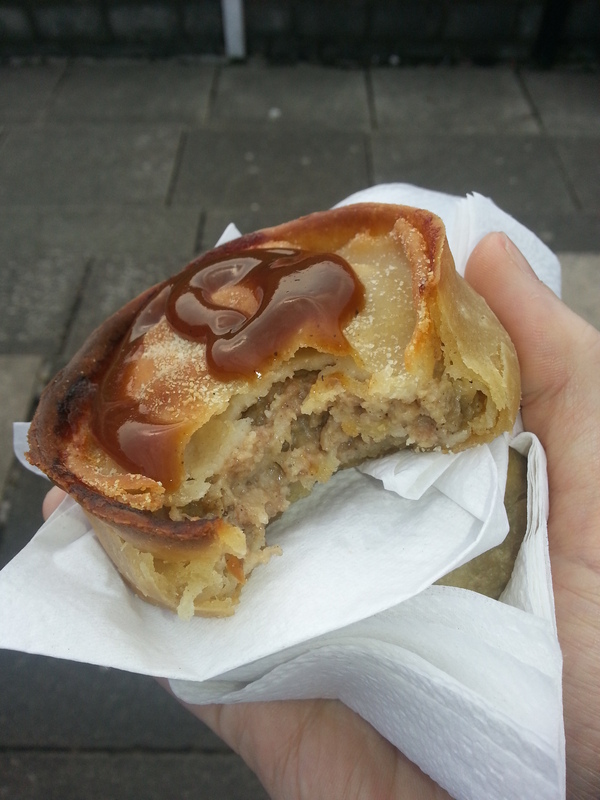 As always with a non-luxury offering I had put a squirt of brown sauce atop of my pie before taking that first bite. With a standard scotch pie you need that squirt of sauce to give that little bit of extra lubrication to help the digestion process and to add another twang of flavour. With a mince and gravy pie the lubrication is already present and as such any brown sauce added could only serve to mask the flavour of the gravy inside. If I’d known I may of refrained from the usual routine, or at least been a little less firm with my routine squeeze. Pastry: This is where I probably should have realised it wasn’t going to be a normal scotch pie, the tell-tale sign of a puff pastry top often indicates that the filling inside is something not usual in nature. It was flaky and golden on top, whilst the soft layers of pastry underneath almost melted into the meat and gravy below. This wasn’t mind-blowing pastry but a lovely addition to the carnivorous concoction inside. There were a couple of gaps were the filling had leaked through but this only added to the overall presentation and flavour of the pie. 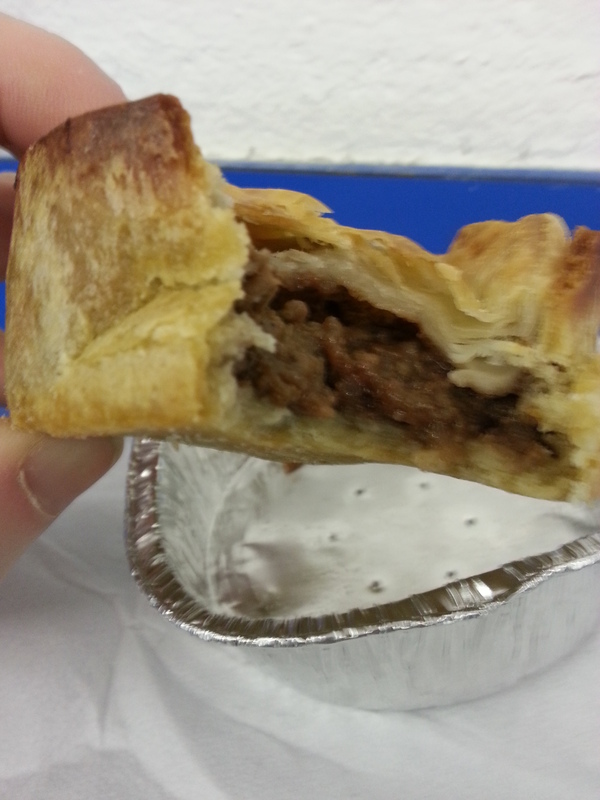 Overall: While the scotch pie is, and should continue to be, the standard-bearer of footballing snackage, this mince and gravy effort is a worthy adversary in the battle for pie supremacy. It was meaty and filled with a lovely gravy topped off with a singular disc of puff pastry. 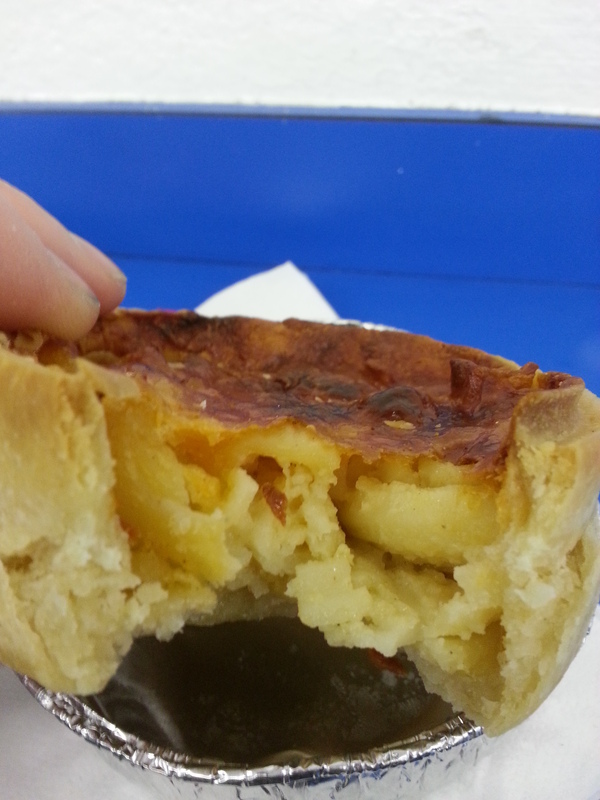 It’s only missing component was that hit of pepper that I so love in scotch pie offerings. Gravy Factor: Mince and Gravy, and there is nothing wrong with that, in fact there was quite a lot right with it. Next time out Meat Filled Pastries has a second helping of pie from East Ayrshire as it takes on a new variety, ‘The Onion Pie’. 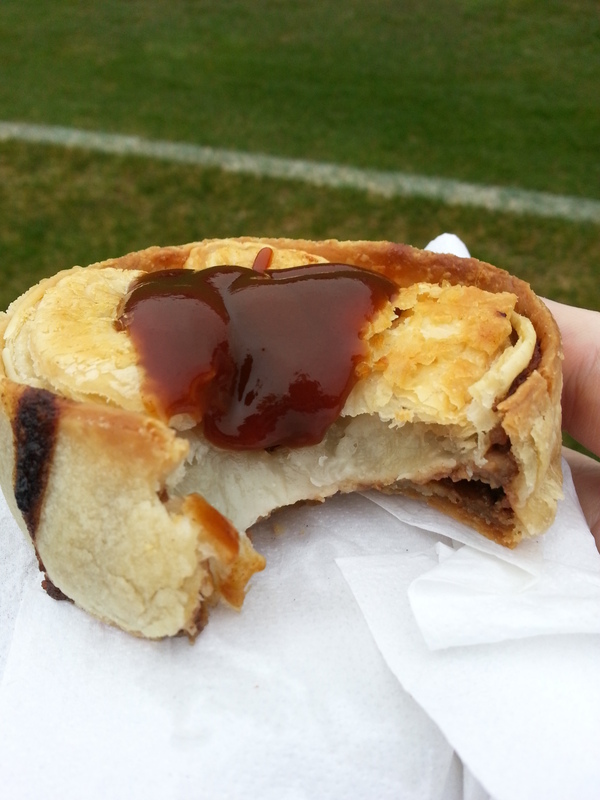 This entry was posted in Football Pies, Junior Pies, Luxury Pies, Sporting Pies, The Life of Pie and tagged auchinleck, aye to pie, brown sauce, filled, Football, Gravy, junior football, leading the line, Meat, meatfilledmerch, meatfilledpastries, mince, pastries, pastry, pollok, puff, talbot. Hello pie lovers and welcome back to Meat Filled Pastries and it’s continual quest to champion football’s only snack of choice the humble pie. Let’s address the elephant in the room straight away. I already know what you’re thinking, ‘How does he have the audacity to call this splendifirous journey of pie Meat Filled Pastries when it’s clear to see that this is a pasta packed pastry presented before me?’. Well firstly, I would ask you to take the bass out of your voice and secondly make you aware of the badgering I have been subject due to the fact I hadn’t reviewed a Macaroni Pie. So here it is, a macaroni pie, if you’re still a bit miffed I hope the small bit of upcoming pie-related word play in this further explanation will help ease your confusion. ‘Meat Filled Pastries’ is a celebration of pie, specifically pie at sporting venues across this fair land of ours. In the main these pies will be filled with meat in a variety of different concoctions that have been brought to the fore on these pages. Some of the most talked about reviews wherever I go are when pies wander from their conventional scotch format and start throwing such ingredients as steak, beans, haggis or potato at you. It’s these curveballs of content that nicely leads into the final point of this introduction. How can we, as connoisseurs of pie, really know which pie is right for us when we don’t give them all a bash; or to put it in pun form ‘Diversi-pie’. To ‘diversi-pie’ is to truly become one with the ethos of Meat Filled Pastries. So without much further ado, and as requested by the proprietor of www.dedicaked.com your one stop shop for all things cake whether they be popped, cupped or celebratory, let’s rate some pie! Price: £2.35. 15p cheaper than the previously reviewed steak offering but 15p more expensive than the also reviewed scotch effort from Ibrox. Already this pie is causing me problems on review. Is this a luxury pie? It’s price, greater than a scotch, would suggest yes but can we truly call a Macaroni Pie one of luxury on Meat Filled Pastries? At present I’m undecided so let’s move on. Presentation: Medium sized white napkin with a snug fitting tin foil case surrounding the pastry. I actually successfully turned this pie upside down without anything falling out but more on that in a bit. Meatiness: Erm, right…there was no meat in this pie. How am I meant to review it’s meatiness when there is no meat within? Time for some tenuous linkage. Now as we know meat in its purest form comes from animals, in the case of a scotch pie it will come from mutton. Mutton is a form of lamb. Lamb’s are most often located on farms, as are cows. Cows, another provider of delicious meaty sustenance, regularly need milked. Milk when separated is turned into two parts; curds and whey. Curds are acidified and drained resulting in the very beginnings of cheese. These are then pressed and matured to turn into the cheese that we recognise in shops, burgers and this macaroni pie that I am trying to review before you. Therefore as cheese is derived from milk which is taken from a cow which we butcher for meat then this is indeed a meat filled pastry, huzzah! Anyway, onto the actual tasting and after a week that was very heavy on the pie consumption it was actually a nice change of pace to bite down on something that wasn’t bursting with gravy. It was very much how I had expected, a compression of macaroni in a pastry case. The pasta was cooked well and there was enough of a cheesy hit coming from it to add another layer of flavour. My only complaint was that after a couple of bites it felt rather dry and going against the usual rules I applied a splodge of tomato ketchup for moisture and as such helping the last few bites slide down easily. Was it better than a bona fide meat filled pastry? That really depends on the pie you’re comparing it against. Against a standout steak or scotch then not a chance but against a bog standard offering I would say at least this offers something different. Pastry: The pastry was of a more complex structure than your average scotch or steak pie. Although the side and base casing weere still standard in nature there was no top. Instead a layer of cheese that had almost burnt created an extra punch of cheesy flavour which did wonders for the overall effect of the pie. On the down side though, due to the fat content within the cheese there was a little bit of tearing when taking the pie out of its tin foil case due to it melting through. However as a man who likes his cheese this was something I merrily picked away at after consumption. Overall: It’s never going to replace a meat filled pastry but if you are ever wanting a change of taste with your Bovril then this is well worthy of your time and appreciation. It was a little dry inside but I loved the cheesy top and I could defiantly see potential in this to become something truly special with a little more of the cheesy gravy inside and the potential to add ingredients such as ham or chilli. All in all a bit of an eye opener really. Gravy Factor: Not your usual meaty gravy here but its cheesy cousin Monsieur Béchamel. Worth a try and the type of gravy I am happy to bracket as luxury due to its unusual nature. Well that was a bit different and it would be a fair assumption to make on your part that this won’t be the last Macaroni Pie you will see. That said the next two offering’s come from East Ayrshire and Auchinleck Talbot, will their pies be as good as their performances on the pitch? We’ll have to wait and see. This entry was posted in Football Pies, Luxury Pies, Professional Pies, Sporting Pies, The Life of Pie and tagged albion rovers, auchinleck talbot, brown sauce, cheese, cow, dedicaked, Diversi-pie, Football, Gravy, ketchup, lamb, leading the line, macaroni, Meat, meat filled pastries, milk, pasta, pastry, rangers, scottish cup, scottish football, vegetarian. It’s pie time. Luxury pie time. 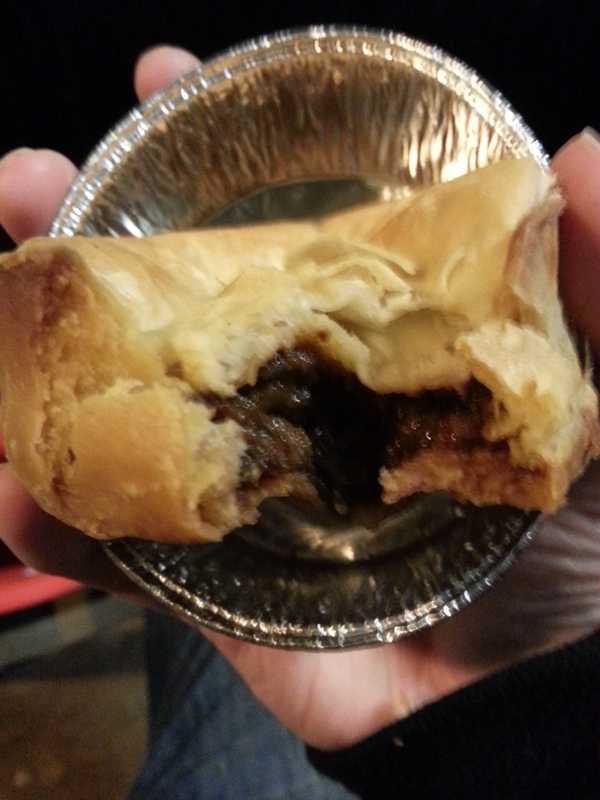 Another hulking brute of pastry, steak and gravy. I’ve done a lot of pie reviews recently and as such I have very little new nonsense to spew forth in your direction as a pre-amble to the main event and therefore without much further ado, let’s rate some pie! 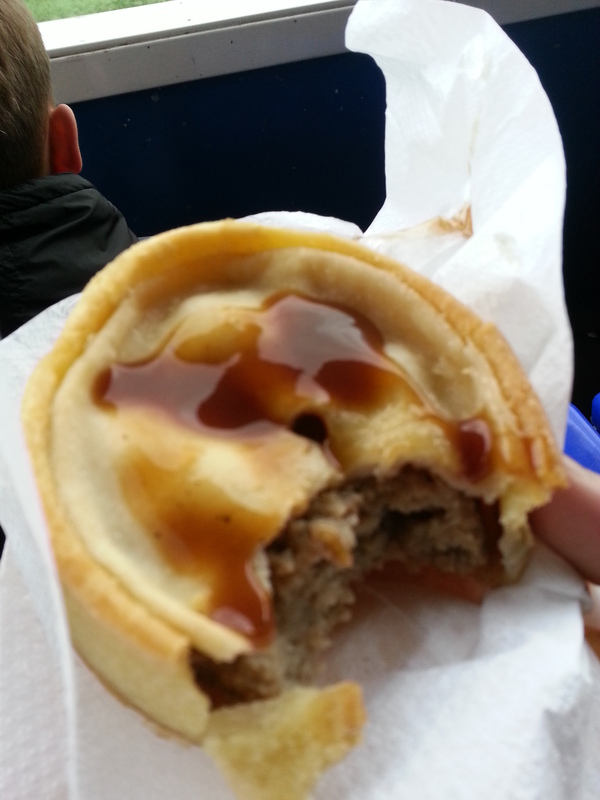 Price: A rather hefty £2.50, a cash equivalent of 2 Junior level scotch pies and a full 50p more than another luxury option, the recently reviewed, Ayr United Steak & Ale Pie (Pie 54). A price symptomatic of the ludicrous idea that if you are a bigger club you are obliged to charge a bigger price when in fact all that you are increasing (apart from my waistband) is the profit you make. Seriously let’s think about this for a minute. How many pies do you think are consumed at Ibrox, Celtic Park or Hampden? A conservative estimate of 5000-7000 let’s say. Now how many are consumed at Cliftonhill, Newlandsfield or Ochilview? A couple of hundred. Now using a fairly basic knowledge of how business works and economies of scale, the larger the bulk amount initially purchased from the supplier is the cheaper the P.P.P (Price Per Pie) becomes. Basically what I am saying is I’m willing to wager a considerable sum that the P.P.P before selling onto the fans is far less at bigger stadia than at smaller grounds. Is that saving passed on? Erm, no. But at least the pie is of far superior quality? Well let’s move on form this digression and see before this rant takes on a life of its own and I end up with another website dedicated solely to the price of pies! Presentation: Your standard steak pie presentation here. A medium-sized white napkin wrapped around a silver tinfoil case, although the case seemed a little battered and bruised and as a result was nowhere near as snug fitting as it would usually be as a pie with a hint of luxury in its make up. Not necessarily a bad thing, as in fact I think it will have prevented the all to familiar scald to the palm often associated with a hot pie and tin foil case. Meatiness: Look here’s the thing it was a nice pie. The first bite produced a more mince based texture meaning a splurge of gravy landing on my lips and as I bit further in bigger chunks of shredded steak were there for my teeth to bite done on and chew. It was seasoned well a wee bit peppery with more salty than some of the other pies I’ve had on this journey but seasoned well nonetheless. The thing is I want my pie, not to be happy with being like all the others, but to stand out from the crowd and have an identity that can only be found at that one footballing location, this pie sadly did not meet that brief. Nice but a little bit soulless. Pastry: The pastry was a mere receptacle for the meat inside. A well fired crust with a base that was soft without leaking into the tin foil case below. The looseness of the tin foil case no doubt helping to prevent the pastry sticking to the bottom of the case, a common problem often found when consuming a luxury pie. Once again it wasn’t offensive, in fact it was nice but was it going to live long in the memory? I don’t think so. Overall: I think the thing that irks me most about paying a premium price for luxury pies in large stadia anywhere is that the addition of the word steak automatically justifies a hike in the price. If I was hungry and I wanted something to eat before or during the game it would do and I would be satisfied but unfortunately I cannot place more praise on it than that. Gravy Factor: Bog Standard Bisto from Waitrose when really a trip to Tesco would be just as good. Sorry that was rather uninspiring, the unplanned rant on pricing aside of course, but as you will already know from this journey I am seeking more than just taste in my pies. Hopefully the next effort from Ibrox later this week will have more to offer, I can guarantee you it’s certainly going to be different. This entry was posted in Football Pies, Luxury Pies, Professional Pies, Sporting Pies, The Life of Pie and tagged albion rovers, chunky, cliftonhill, Football, Gravy, ibrox, leading the line, meatfilledpastries, mince, pastry, Pie, PPP, Price Per Pie, rangers, scottish football, steak.